One of the benefits and pleasures of travelling is experiencing the food of the places that you visit. Often when you ask people about their holidays, they will pick some of the best things they saw but you are almost guaranteed they will always tell you about the food whether good or bad! Of course, one of the best things about trying and enjoying new dishes is coming home and trying to make them yourself. From ancient times the joys of food have been celebrated in art, writing, songs and the ultimate accolade of taking foodstuffs to the grave for the afterlife. Probably the most famous is the Ancient Egyptians who meticulously planned for the afterlife all through their living moments and this included which food to take with them as found in their tombs. Egypt is one of those places where you can see and try food much as it has always been since the Ancient Pharaoh times. We are going to start this series with breakfast! We have to start with bread and it all began in Egypt. In ancient Egypt, bread was made of a kind of ancient wheat called “Emmer”. Wheat had an important status in the Ancient Egyptian economy. It was not only used for bread making; it was also a form of payment. Wheat was both a strategic commodity of the state and kept in vaults, as well as an investment for more difficult times. The story of Joseph saving Egypt and the surrounding Countries from famine by storing grain in Egypt is an example of the importance of Egypt in wheat production. This wheat growing tradition, which dates back more than 5,000 years, brought about Egyptian “Baladi Flatbread” – a very special bread that is not like any other. Though it may look similar to pita bread in shape, Baladi Flatbread has a much different taste and since Ancient times has been seen as “life” and is served at all meals in Egypt. Ful is the most common traditional breakfast and is pronounced as “fool”. Made of fava beans cooked with oil and salt it provides a filling and nutritious start to the day and often served with a boiled egg. The soaked beans are cooked for hours over low heat in an “idra” in order to remove the beans casing. 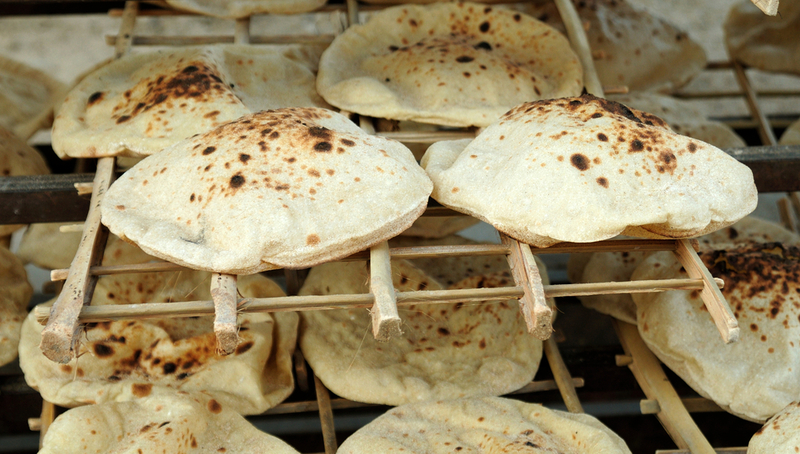 Traditionally this is how they are cooked and served by street carts in Cairo and around the country and served with traditional bread – It is believed that Ful was cooked all the way back in ancient Egypt. 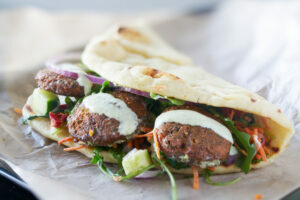 Falafel is another breakfast favourite. Traditional falafel is made with chickpeas, but Egyptians ta’meya is made of fava beans. The crushed beans are then mixed with a fresh combination of chopped coriander, parsley, white onion and garlic, giving its vibrant green colour. Spices such as cumin, coriander, paprika, cayenne, salt and pepper are added along with chickpea flour. Rolled into balls, and fried! 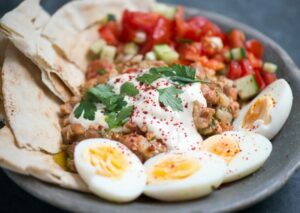 Served with tahini and Egyptian baladi bread a perfect breakfast choice. Of course, falafel is seen in many Western supermarkets now but nothing can compare with the freshly made ones in Egypt. Beid Bel Basturma is a beef with eggs breakfast dish. The beef in this dish is dried with a paste of cumin, garlic, fenugreek and paprika, and the smell alone is enough to make your mouth (and eyes!) water in anticipation. 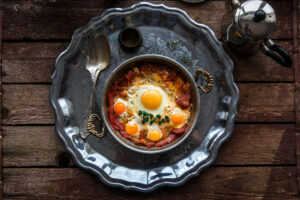 This Egyptian version of ‘bacon and eggs’ has Armenian origins, but is still made according to the traditional recipe. 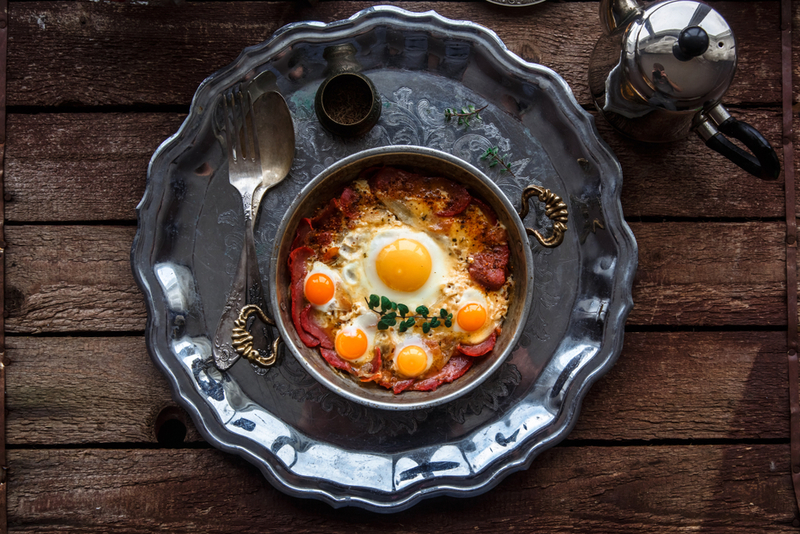 The complete dish is made by cooking eggs in copious amounts of ghee and then adding slices of basturma to the mix. Beid Bel Basturma traditionally may only be consumed with fresh baladi bread. Look out for our next post which will cover the most popular lunches in Egpyt. Better still why not check out our trips to Egypt and try the food first hand.